Legit Reviews came across a photo of a new massive processor cooler from Prolimatech. The name of the cooler is unknown, but it's even bigger than the firm's Genesis heatsink. 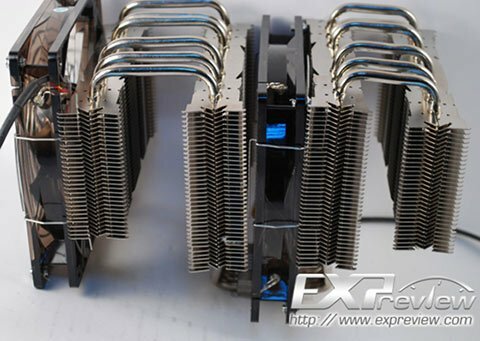 It looks like the cooler has five heatpipes, there are four aluminium fin arrays and there's room for up to five fans! It looks like this cooler has five heat pipes, but without a base shot we can't tell if they are continuous or not. If they are each one heat pipe that means that each have six bends in them! Could all those bends hurt performance or are they mandrel bent? We hope we get one in for testing to find out! If you thought the Prolimatech Genesis heatsink was crazy big, we can't wait to hear what you think about this one!